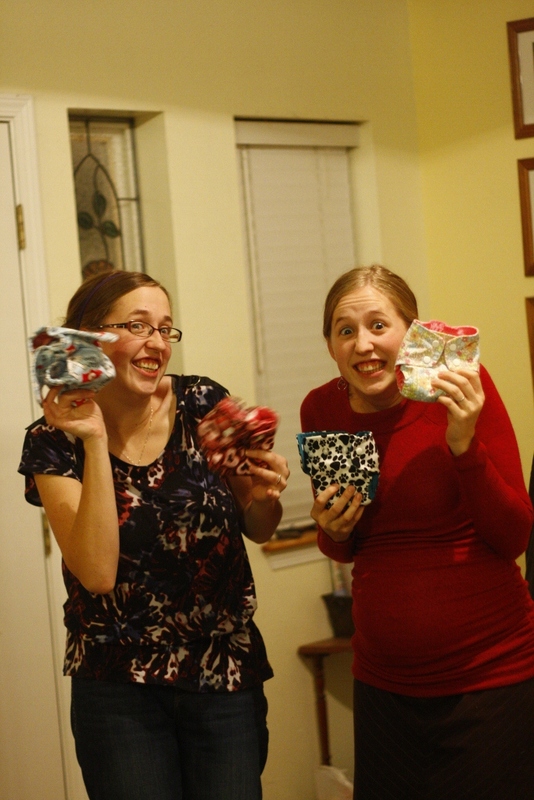 I’ve always used cloth diapers at least part of the time with my babies, both for economy and comfort, so I was thrilled when both my expectant daughters said they’d like some cloth diapers for their babies. I made quite a few all-in-one diapers in the past. All-in-ones (AIO’s) are multi-layer fitted diapers that are sewn to a water-resistant outer layer. The water resistant layer is usually made of polyurethane laminate (PUL), a plastic-backed stretchy polyester fabric. These diapers worked relatively well for me, but they did sometimes leak. My sister who has been cloth-diapering more recently says that she’s had better leak resistance with diapers and covers that are made separate from each other. So that’s what I decided to start with for our grandbabies. 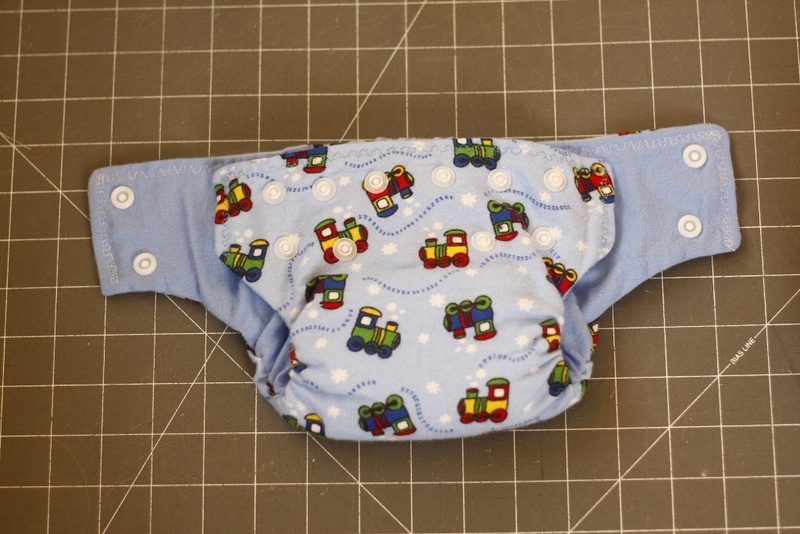 The diapers are an hourglass shaped flannel diaper with elastic and snaps for a good adjustable fit, and they have a pocket in the back so that you can add additional layers (called soakers) for more absorbency. I’ll talk about diaper covers in a future post. If you’ve never made a diaper before, or don’t have much sewing experience, you might fear that diaper-making is complicated. It is true that there are quite a few steps to making this type of diaper. But here’s a great thing about diapers: babies need LOTS. If your first diapers aren’t perfect, make more. You’ll get better as you go. This tutorial is just a starting point. If you have a bit of sewing experience, you’ll probably see other ways to get a similar result, and will easily be able to customize/modify instructions for yourself. If some of the instructions are unclear, ask questions and I’ll try to clarify. Not everyone will need all the details I’m including, but I am trying to make this project doable for folks with little sewing experience. I usually make my own diaper patterns using newspaper. Sewing margins are 1/2 inch. Here are the dimensions of various sizes. Scroll on down to the size large to get a better idea of the shape. Sometimes I make my diapers with squared-off corners and sometimes I round the corners a little. Newborn should fit most babies in the 6-10 pound range. The SMALL size has a similar shape and will work for babies in the 9-14 pound range. It has the following measurements. Once I get the rough dimensions of a pattern blocked out on a piece of newspaper, I fold the paper in half lengthwise so that I can trim both sides of the pattern at once. That way both sides will match. If your first pattern comes out odd-looking, grab another piece of newspaper and try again. When you are done cutting out a few hourglass shapes as shown above, you will have lots of smaller scraps. These are what you’ll use for your sewn-in soakers. Cut that leftover fabric into 4×6 inch ovals. They don’t have to be exactly that size, and they don’t even have to be the same kind of flannel. These layers will be sandwiched within the diaper, so anything absorbent and cotton will do. Stack 5 ovals together and zigzag stitch or serge them together. Then zig-zag stitch these stacked soakers to the wrong side (the unpretty side) of the inner layer of your hourglass shapes. 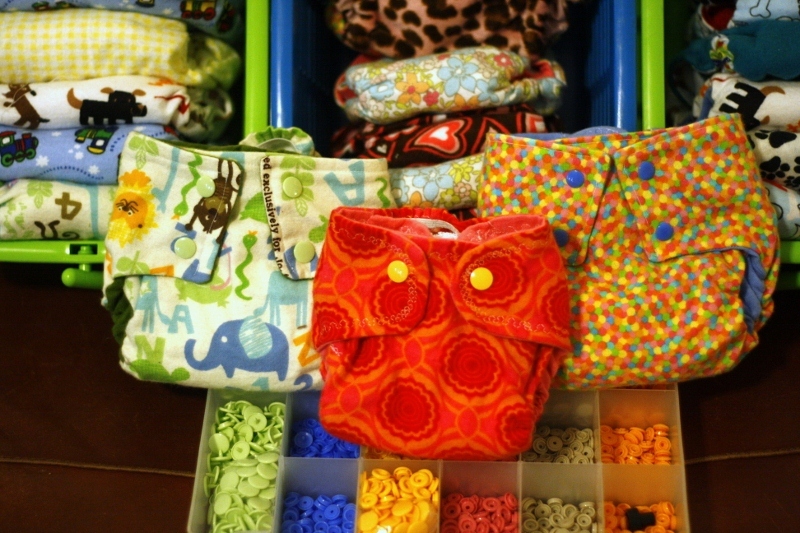 Now you’ve got diaper pieces that look like the picture above, all ready to be sewn together. Stack your hourglass shapes on top of each other with the back sides of the fabric facing out and the pretty sides of the fabric facing each other. 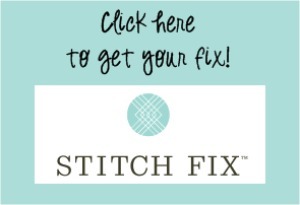 You will probably want to pin your fabric together so it doesn’t shift while you sew. You will be sewing around the whole perimeter of the diaper EXCEPT for a 4 inch wide space at the very back of the diaper. You can see the space marked with pins in the following picture. 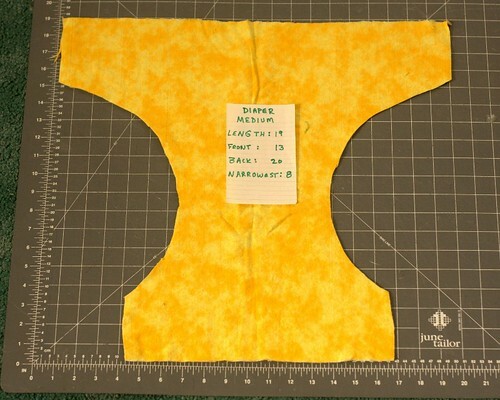 The picture above shows the width of the seam allowance, and the diaper with layers sewn together. You can probably also see that my seams are not perfectly straight. No biggie. These are diapers. They can be adorable and functional without being perfect. Now it is time for the leg elastic. You need two 4-inch pieces, one for each leg hole. I elasticize the whole inner curve, cutting the elastic to be about half the length of that curve to gather the curve nicely. Zig-zag stitch the elastic to the entire inner curve of each leg hole right at the very edge of the fabric. 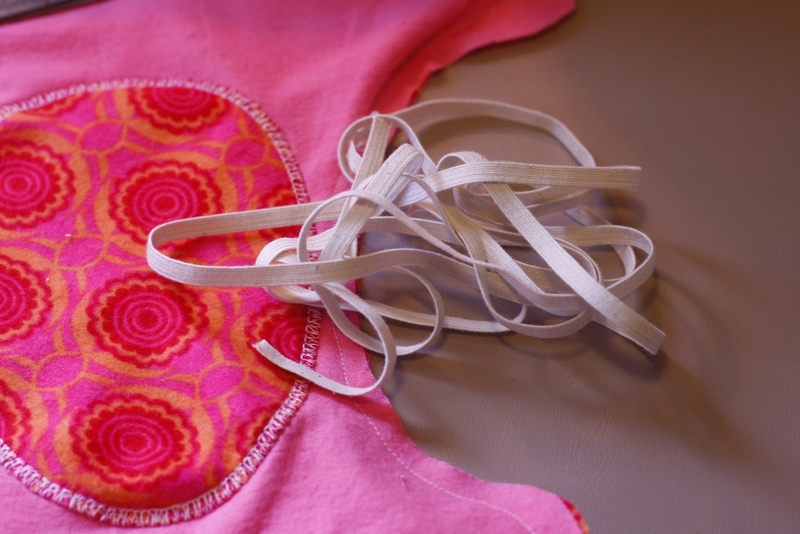 It is easiest to sew if you start by pinning both ends of the elastic to the inner curve of the diapers, then zig-zag stitch the elastic between the pins, stretching evenly as you stitch. Be sure to double-stitch both ends of the elastic securely. Now it’s time to turn your diaper pretty side out. I will sometimes poke a popsicle stick or the fat end of a chopstick into the corners to get the edges and curved corners of the diaper nice and crisp before I top-stitch. 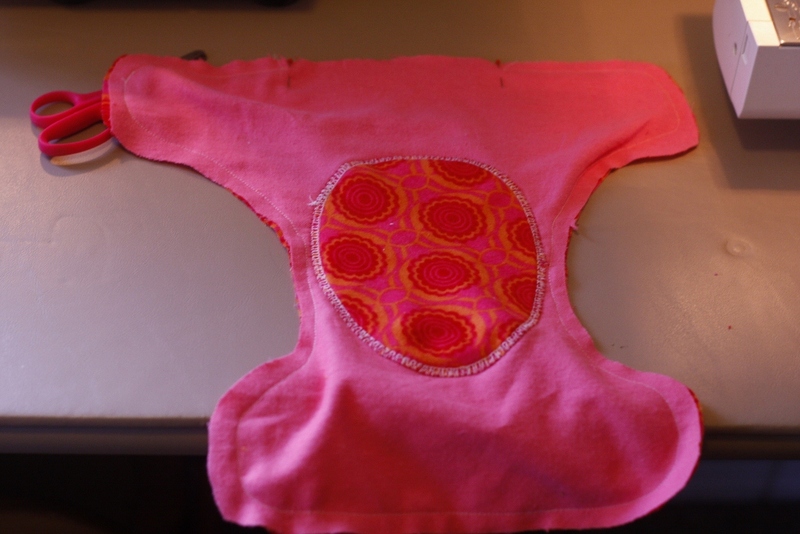 Here’s a picture of the diaper turned and top-stitched. It’s really starting to look cute, isn’t it? #4 is nice decorative stitch on my machine. Or sometimes I just do a straight stitch, which also looks nice. 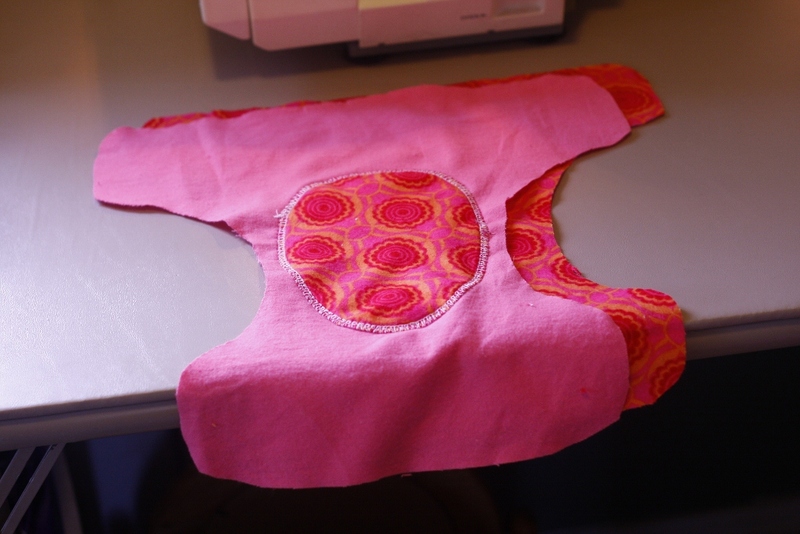 Top-stitch around the front and back of the diaper, skipping the gathered areas and the open area in the back. Here’s how it looks with the top stitching done on the front of the diaper. We’re getting near the end of this project. All that’s left to be done now is soakers, back elastic, and snaps or velcro. In the past I’ve made soakers that tuck into the back pocket and are completely removable when washing. Removeable soakers dry more quickly, and are versatile. For example, at night you might tuck two soakers into the pocket instead of just one. The down side of completely removable soakers is that you have to reassemble the diapers before use, which can sometimes be daunting for dads, babysitters or others not familiar with your particular diaper system. My sister came up with a solution that is the best of both worlds. She sews one end of a soaker to the back edge of each diaper. When it’s time for the diaper to hit the wash, she pulls it out of the diaper for more efficient washing and drying. But since it is still attached to the diaper, there’s no hunting for missing parts. Just tuck the soaker back into the dipe before use and you’re ready to go. Tuck your soaker (washcloth) into the pocket. 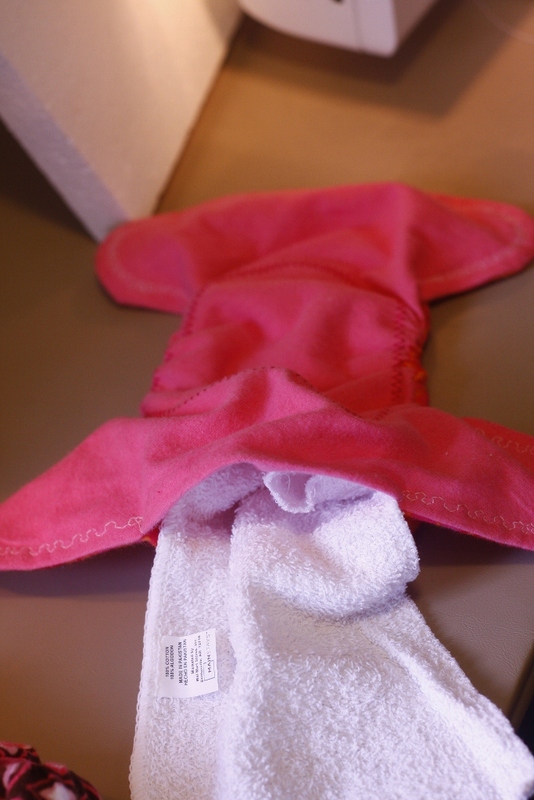 For a half washcloth you will line up the narrow edge of the washcloth with the front (inside) edge of the pocket. 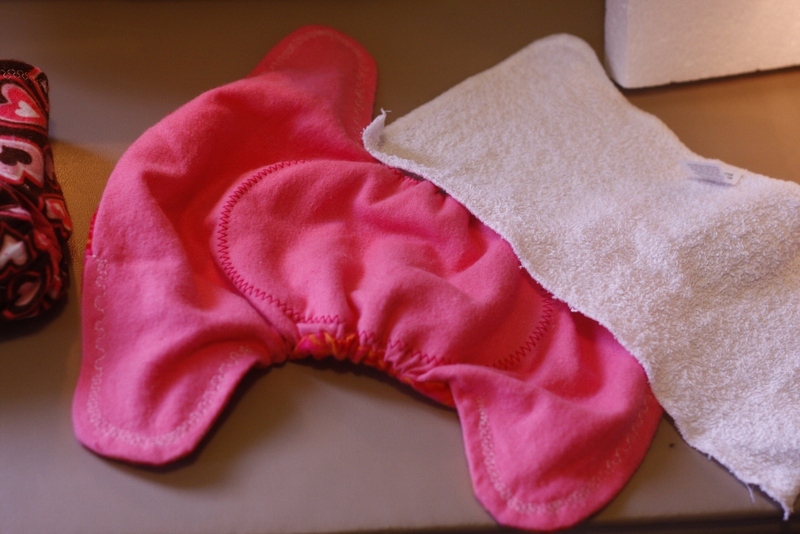 If you’re using a whole washcloth, you can fold it in halves or thirds and line it up with the front (inner) edge, making sure when sewing to catch all the layers of the washcloth so it will stay folded. Also make sure that you fold the unfinished edge of flannel in toward the washcloth — that way, as you sew, you will also be hemming the inner edge of the pocket. Finally it’s time to add snaps. (Velcro is another option. After many washings it tends to lose its power, but if you remember to add washing tabs, velcro is a very reasonable choice and is easy to apply.) This time around my sister loaned me her professional-quality snap press– a huge but very effective beast– so I am going with snaps. You can buy many colors of snaps here. The snaps shown here are a size 20, and are extremely durable. I did a single row of snaps for the newborn size diapers and a double row of snaps for the size smalls, for added adjustability. Below you can see the snap pattern I did on the size small. This will allow three different positions to fit a growing baby. If you’ve chosen to make two-layer diapers, you wi probably want to tuck a smaller extra piece of fabric between the layers in the location where you will be installing the snaps to give the snaps more material to bite into. Also be sure to pull the washcloth out of the diaper so that you don’t accidentally hook it into the snaps. You want it free to pull out of the diaper for faster drying. If you have questions about the project, or would like to add your own expertise, please comment below. 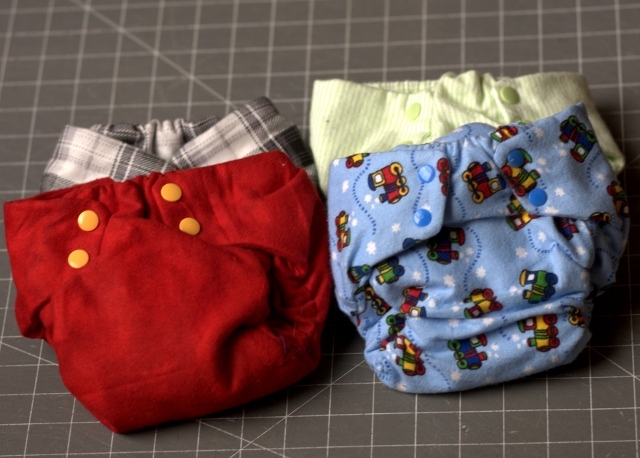 There are lots of good ways to make diapers, and they can be really fun projects. 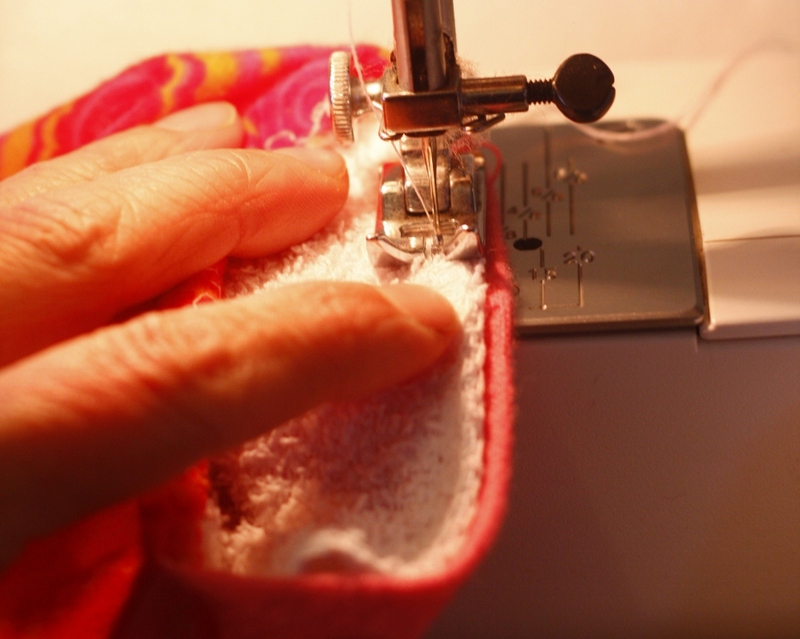 Once you get familiar with the process, you’ll most likely be able to sew a whole diaper start to finish in an hour or less. I’m pretty sure I could have sewn at least 4 in the time it took me to write this post! 🙂 Here’s a post showing how I make diaper covers. And this post wouldn’t be complete without a picture of our daughters making a big fuss over the little diapers for their precious babies. What fun we will have! I never thought I’d say this, but that diaper is so cute! I would die for those sewing skills! These are just adorable! I was wondering what kind of detergent you use on these? I use a homemade laundry detergent that is safe for most cloth diapers (http://the-north-forty.com/2011/11/28/homemade-cloth-diaper-laundry-detergent/). Do you think it would work? Or is there a special washing technique you have found works best? Thanks! Yes, your homemade recipe should work fine. It’s the commercial detergents that are hardest on cloth diapers in my understanding. According to this youtube video, however, a few store-bought detergents (like Arm & Hammer) won’t ruin the absorbency of your cloth diapers. Great! Thanks! I’ll definitely have to give making my own a shot! Great work, Mary! They are turning out absolutely adorable! Love the cute little bellies! The diapers look so big in the photos, then it is jarring to see the mommies holding them and realize (remember) how small diapers for that size really are. They are definitely adorable. So much cuter than the plain white cloths my poor child suffered through. Maybe THAT is why he has zero fashion sense now. Hmmm. We don’t know yet if Amanda and Ben’s baby is a boy or a girl. I figure once the babies are born, the mommies are probably more likely to enjoy using diapers that are specifically ‘boy’ or ‘girl’, So I’m making some of each, to be prepared either way. 🙂 Can ya tell I’m having fun? Love them! 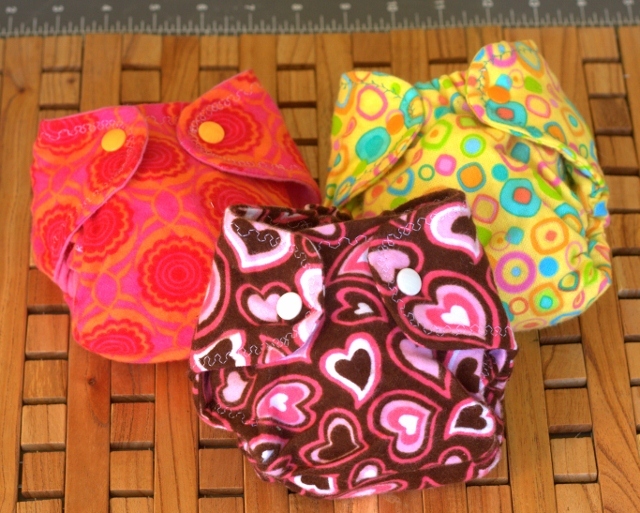 I am going to attempt some diapers this winter for my spring baby! These are adorable. (And the girls are too!) Thanks for the work that you put into presenting this. I hope to make them for someone- though, none of my friends are pregnant right now. But I can make them anyway – they’ll keep. I don’t know how soon I’ll get around to starting this project, so I hope you won’t mind if it’s months later when I take you up on your offer to clarify a step I might have trouble executing. Great directions…I may actually try it…after baby arrives in a couple weeks. 🙂 What size of elastic did you use? Where can I find a way to attatch snaps? OR What velcro would work best. I am not sure I’m really brave enough for this, but we’ll see. 🙂 Worth a try! 1/4 inch elastic seems to work for me. Wider velcro is better, I think, probably in the range of 1-1/2 inches, and is probably the most affordable way to go if you are trying cloth for the first time. Here’s info about the snap press I’m borrowing from my sis http://verybaby.com/ecom-catshow/professional-snap-press-and-dies.html It is kind of expensive though. CUTE diapers! I love making diapers for my little ones, and I’ve also had the best luck with making the fitted diapers and having a separate cover. I do this for my newborns, but after that I buy the one-size diapers since I generally have more than one in diapers for at least a few months! Thank you thank you for all these explanations! I’m REALLY bad at sewing, but i feel i can give a try after reading this… i can hardly believe that i was thinking about sewing my own (ok, my baby’s own) diapers all week long, desperatly looking for the good and detailled explanations, and i come today on one of my favorite blog and here it is! Here’s the link to a simple (less expensive) snap system. Thank you for sharing this. I just purchased a book to make diapers for our upcoming adoption. It is great to hear from someone who has actually used the diapers. Those would make the cutest gifts! Very clever. Thanks for sharing! Also…..have you heard of “wool soakers”? Just google it. Wool will hold much more and is great at wicking moisture away from the skin. I love CDing. I’ve used cloth for all 5 of mine, but I feel like I’ve finally “perfected” my system now with #5. I discovered wool!!! It is so soft, so absorbent, and so breathable. Now I exclusively use cotton soakers with wool covers. I mostly have boring white prefolds, though… The wool covers can be pricey, but you only need 2-4 per size, and you can make your own out of old sweaters, or knitting if you know how (I don’t… yet : )). My baby has excema, and I think poly fabrics exacerbate it, so I don’t use poly sleepers for her either–I make wool “longies” (pants/leggings) out of the arms of a felted sweater (cashmere is great!) and a pull-over vest out of the body (using the neckline to make it easy), and that with a long-sleeved cotton shirt works wonderfully. She looks so soft and cozy! That’s actually what she wears during the day usually too, just with a little dress instead of a T.
Also, diaperswappers.com is a great source for gently-used diaper supplies–I got my 2 favorite wool covers there. Those are so cute! I shave always used cloth diapers and love them. Those are very pretty. Thanks for the tutorial! Thanks so much for this!! Im waiting for our little guy to arrive and just made one of these today. It was fun 🙂 thanks, too, for pointing out your “crooked” stitches — I’m a beginning seamstress and it gave me hope that I could actually make a diaper! Good job!!! I’m sewing diapers today too! Do you have measurements for larger babies? My daughter is already almost 20 pounds, and I didn’t see any place where there are measurements for babies larger than 16 pounds. I really want to make these for her, and save us a TON of money. Awesome, this is a great tutorial! My best friend, sister, and cousin are all having babies. Two are registers for cloth diapers but they’re so expensive, and not as cute. Definitely going to try to make some.